Understanding the neurobiology of sleep and its benefits on health and wellness continues to evolve, and new strategies have emerged to treat individuals with sleep disorders. Sleep medicine is poised to deliver care in a precision medicine model. For example, some sleep centers are using pharmacogenomics to identify better fits for medication use for patients with sleep disorders to maximize benefits and minimize potential adverse effects. New tools help nonsleep specialists identify patients with potential sleep disordersand some generate referrals, implement behavioral modifications (eg, patient homework), and provide customized education, including outlining next steps and risks of not being evaluated and treated (Figure 1).1 Every year, new options emerge to better evaluate and treat patients with sleep disorders. Many devices and treatment options are in early-stage development, and others are in clinical trials or available. Figure 1. Screenshots from MySleepApp show how digital screening can help identify and advise patients about potential sleep disorders. Chronic insomnia is generally categorized as difficulty falling asleep or maintaining a regular sleep schedule for at least 3 months.2 Patients often experience daytime sleepiness and/or reduced cognitive function that negatively interferes with daily life, affecting productivity and mood. Insomnia remains a clinical diagnosis based on these symptoms and does not require polysomnography. Clinicians, however, now have Food and Drug Administration (FDA)-approved home monitoring devices to help evaluate insomnia, which can provide high-value care for patients and more individualized understanding of a particular patient’s sleep patterns. Medications to treat insomnia are not always warranted or recommended, but there are times when they can be considered. Hypocretin antagonists are relatively new treatments for insomnia. 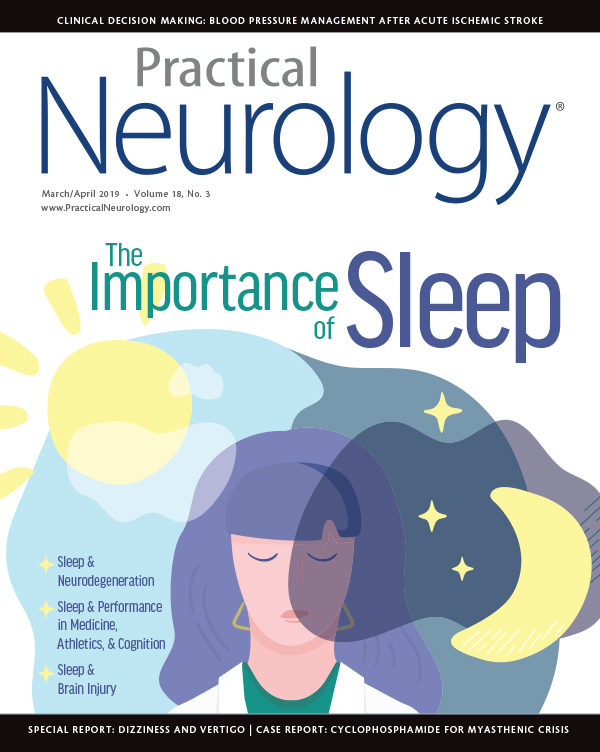 (See Sleep, Sleeplessness, and Neuropsychiatric Conditions in this issue). With a move toward precision medicine, clinicians are able to personalize health care to each patient’s unique variables that trigger and subsequently mitigate their insomnia symptoms. For example, individuals suffering from insomnia due to post-traumatic stress disorder or substance-use disorder may respond better to certain approaches compared with others.17,18 Pharmacogenomics is being used for patients with insomnia when medications are indicated, allowing for identification of a better medication match for the patient. In some instances, evidence for the lack of a good medication fit facilitates engagement in CBT–I. From a clinical perspective, sleep specialists may recommend other commercially available sleep tools (eg, white-noise devices, light therapy, blue/green-light–blocking glasses, or special blankets, mattresses, or pillows). Weighted blankets, which have been found to increase sleep time and provide more secure sleep, may be of benefit for patients with insomnia but have not been subjected to any rigorous study. Despite the lack of an evidence base, clinical experience has demonstrated that cooling mattresses, pillows, and blankets may also provide some benefit for insomnia, particularly in patients with neurologic disorders (eg, multiple sclerosis) who have heat sensitivity or in postmenopausal women who experience flushing during the night. Although efficacy data are limited, sleep specialists are bringing such tools into their armamentarium to provide comfort and more personalized care for patients. Technology companies have also been developing consumer devices aimed at improving sleep quality (eg, Ebb Insomnia Therapy headband, Dreem Headband, SomniResonance SR1 sleep device, Dodow Sleep, and URGONight), but further study is required to assess their place in clinical practice. In addition to CBT-I, medications may be used to help manage CRSWD. Melatonin is commonly used as a circadian rhythm anchor; however, the recommended dosages and timing remain unstandardized. Chronotherapy (gradually shifting the sleep time in accordance with a desired schedule) and bright light therapy can also be used to reset the sleep-wake rhythm and help alleviate insomnia or hypersomnia. Increased or decreased exposure to bright light at a particular time can significantly stabilize the circadian rhythm, thus improving sleep and mood. Physical exercise may also be beneficial. Exercise increases the core body temperature, reduces anxiety, promotes serotonin release, and modifies immune function, all of which may benefit sleep initiation. Exercise at different times of the 24-hour day has been shown to result in phase advances that are specific to the time of exercise, and, thus, can be strategically used to gradually shift the circadian rhythm to be parallel with the desired cycle, resulting in improved sleep quality. Whereas late nocturnal exercise can delay circadian timing, exercise in the early evening can advance the intrinsic biorhythm.21 It is important to speak with patients regarding their exercise routines and work with them to identify optimal exercise times that will not interfere with their sleep and may even improve sleep quality. Among the most common sleep-related breathing disorders, obstructive sleep apnea (OSA) affects patients of all ages. Patients with morbid obesity, type 2 diabetes, epilepsy, or cardiovascular disease are at higher risk for OSA, which occurs when upper airway obstruction leads to repetitive episodes of apnea or hypopnea during sleep. Typically associated with heart failure or neurologic disease, central sleep apnea (CSA) is less common, occuring when the central neural signal to breathe is not transmitted. Patients with OSA or CSA experience difficulty breathing during sleep, insomnia, daytime fatigue or sleepiness, and/or snoring. Sleep apnea is associated with several risks (eg, cardiac disease, stroke, hypertension, diabetes, reflux, erectile dysfunction, weight gain, memory and concentration issues, and mood disturbances) and can be listed as a cause of death on death certificates. Central hypersomnias, including idiopathic hypersomnia (IH) and narcolepsy, result in profound hypersomnia or excessive daytime sleepiness.31 Narcolepsy, often un- or under-diagnosed, can affect almost all aspects of life with sudden episodes of hypersomnolence. Type 1 narcolepsy is the combination of hypersomnia and either cataplexy— sudden loss of muscle tone triggered by strong emotions—or a deficiency of hypocretin (orexin), a chemical that promotes wakefulness, arousal, and appetite. Type 2 narcolepsy does not include cataplexy or a hypocretin deficiency. There are no approved medications for treatment of IH. Modafinil, various stimulants (eg, methylphenidate), and sodium oxybate are generally used off-label for hypersomnia in IH. Other treatments such as BTD-001, a GABAA antagonist, are currently in development.38 Finally, referral to the sleep behavioral psychologist can also be helpful in improving behaviors and practices for better sleep quality. Figure 2. The neurobiology of restless leg syndrome (RLS). A1R, adenosine 1 receptor. Courtesy of Julia Duvall and Tyler Pugeda, Baltimore, MD. Long-term treatment of RLS can be challenging and pharmacogenomics may be helpful. 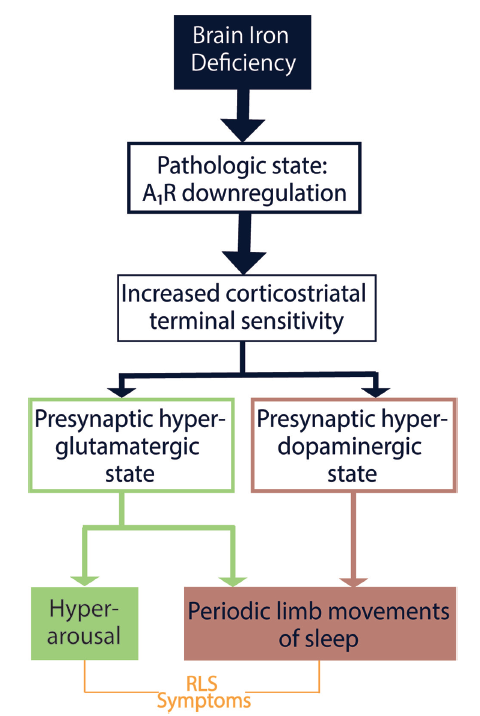 The development of new drugs acting on adenosinergic (including recent report of the use of dipyridamole) and glutamatergic neurotransmission hold promise, but require further investigation.50 As the genetic underpinnings and central and peripheral pathophysiology of this disorder are being revealed, more targeted therapies can be developed to address the specific mechanism of disease. Several new and promising avenues to treat sleep disorders have arisen in recent years. Time will tell which of several novel agents currently at various stages of clinical trials are safe and effective. Longitudinal outcome studies are required for newly approved management options to assess their long-term safety and efficacy. Regardless, the outlook is promising that providers will have a greater armamentarium of treatment options as we are just beginning to reveal and target the underlying mechanisms of sleep and wake. 1. Doshi A, Gamaldo CE, Dziedzic P, et al. 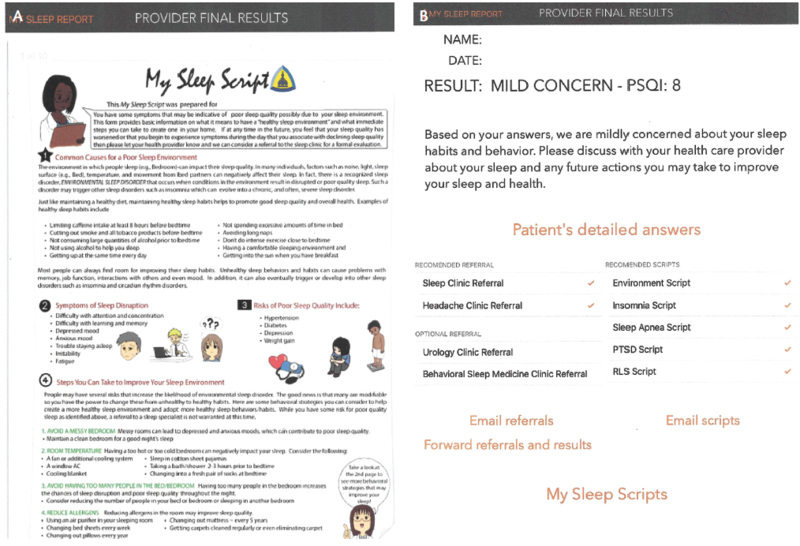 Finding time for sleep: identifying sleep concerns in non-sleep specialty clinics using the MySleepScript App. J Mobile Tech Med. 2017;6:2:19-27. 2. Edinger J, Buysee D, Lichstein K, Mindell J, Morin C. Insomnia. In: Sateia M, ed. International Classification of Sleep Disorders. 3rd ed. Darien, IL: American Academy of Sleep Medicine; 2014: 19-46. 3. Qaseem A, Kansagara D, Forciea MA, Cooke M, Denberg TD. 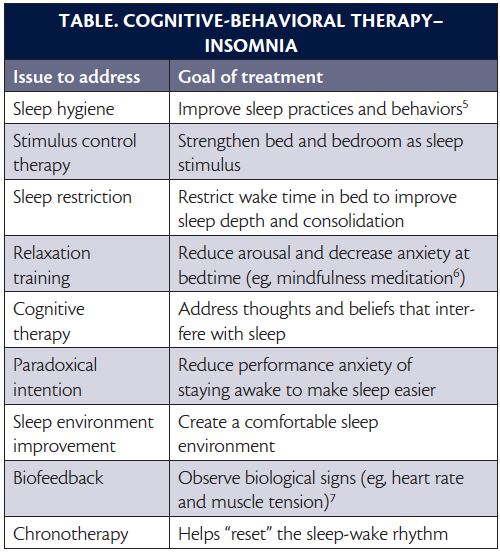 Management of chronic insomnia disorder in adults: a clinical practice guideline from the American College of Physicians. Ann Intern Med. 2016;165(2):125-133. 4. Saddichha S. Diagnosis and treatment of chronic insomnia. Ann Indian Acad Neurol. 2010;13(2):94-102. 5. Johns Hopkins Medicine. Preparing your bedroom for a great night’s sleep. Johns Hopkins Medicine website. https://www.hopkinsmedicine.org/health/healthy-sleep/sleep-better/preparing-your-bedroom-for-a-great-nights-sleep. Accessed February 9, 2019. 6. Johns Hopkins Medicine. Sleepless nights? Try stress relief techniques. Johns Hopkins Medicine website. https://www.hopkinsmedicine.org/health/healthy-sleep/sleep-better/sleepless-nights-try-stress-relief-techniques. Accessed February 9, 2019. 7. Levendowski DJ, Ferini-Strambi L, Gamaldo C, et al. The accuracy, night-to-night variability, and stability of frontopolar sleep electroencephalography biomarkers. J Clin Sleep Med. 2017;13(6):791-803. 8. McCarthy MS, Matthews EE. Effects of an internet-based videoconference cognitive behavioral therapy for insomnia intervention. Sleep. 2017;40(S1):A141. 9. Ong J, Sholtes D. A mindfulness-based approach to the treatment of insomnia. J Clin Psychol. 2010;66(11):1175-1184. 10. Rusch HL, Rosario M, Levison LM, et al. The effect of mindfulness meditation on sleep quality: a systematic review and meta-analysis of randomized controlled trials. Ann N Y Acad Sci. 2018. doi:10.1111/nyas.13996. 11. Ding L, Wang J, Yang H, Yu J. [“Governor vessel daoqi method of acupuncture” combined with estazolam for insomnia: a randomized controlled trial]. Zhongguo Zhen Jiu. 2018;38(5): 4633-4637. 12. Cao H, Pan X, Li H, Liu J. Acupuncture for treatment of insomnia: a systematic review of randomized controlled trials. J Altern Complement Med. 2009;15(11):1171-1186. 13. Lam TH, Chung KF, Lee CT, Yeung WF, Yu BY. Hypnotherapy for insomnia: a randomized controlled trial comparing generic and disease-specific suggestions. Complement Ther Med. 2018;41:231-239. 14. Shekelle PG, Cook IA, Miake-Lye IM, et al. Benefits and harms of cranial electrical stimulation for chronic painful conditions, depression, anxiety, and insomnia: a systematic review. Ann Intern Med. 2018;168(6):414-421. 15.Salas R, Galea J, Gamaldo A, et al. Increased use-dependent plasticity in chronic insomnia. Sleep. 2014; 37(3): 535-544. 16. Tang HY, Riegel B, McCurry SM, Vitiello MV. Open-loop audio-visual stimulation (AVS): a useful tool for management of insomnia? Appl Psychophysiol Biofeedback. 2016;41(1):39-46. 17. Hendrickson RC, Raskind MA, Millard SP, et al. Evidence for altered brain reactivity to norepinephrine in veterans with a history of traumatic stress. Neurobiol Stress. 2018;8:103-111. 18. Bramoweth A, Luther J, Hanusa B, et al. Clinical characterization of insomnia among veterans with PTSD: identifying risk factors for diagnosis and treatment with sedative-hypnotics. Defence Peace Econ. 2018;29(1):78-90. 19. Zee P, Owens J, Auger R, et al. Circadian rhythm sleep-wake disorders. In: Sateia M, ed. International Classification of Sleep Disorders. 3rd ed. Darien, IL: American Academy of Sleep Medicine; 2014:189-224. 20. Smith MT, McCrae CS, Cheung J, et al. Use of actigraphy for the evaluation of sleep disorders and circadian rhythm sleep-wake disorders: an American Academy of Sleep Medicine systematic review, meta-analysis, and GRADE Assessment. J Clin Sleep Med. 2018;14(7):1209-1230. 21. Buxton OM, Lee CW, L’Hermite-Baleriaux M, Turek FW, Van Cauter E. Exercise elicits phase shifts and acute alterations of melatonin that vary with circadian phase. Am J Physiol Regul Integr Comp Physiol. 2003;284(3):R714-24. 22. Kandel SP, Shalom IH, Kitzen O, Ahmed Q, Weinstein MD. Early intervention with single session “mask-fitting” improves CPAP adherence in obstructive sleep apnea syndrome patients. Am J Resp Crit Care Med. 2018;197:A1495. 23. Aufieri R, Picone S, Gente M, Paolillo P. 3D printing in neonatal care. Ital J Pediatr. 2015;41(Suppl 1): A1. 24. Ravesloot MJL, White D, Heinzer R, Oksenberg A, Pepin JL. Efficacy of the new generation of devices for positional therapy for patients with positional obstructive sleep apnea: a systematic review of the literature and meta-analysis. J Clin Sleep Med. 2017;13(6):813-824. 25. Ravesloot MJL, Maanen JPV, Dun L, de Vries N. The undervalued potential of positional therapy in position-dependent snoring and obstructive sleep apnea–a review of the literature. Sleep Breath. 2013;17(1):39-49. 26. Wray CM, Thaler ER. Hypoglossal nerve stimulation for obstructive sleep apnea: a review of the literature. World J Otorhinolaryngol Head Neck Surg. 2016;2(4):230-233. 27. Poinkowski P, Javaheri S, Michalkiewicz D, et al. Transvenous phrenic nerve stimulation for the treatment of central sleep apnoea in heart failure. Eur Heart J. 2012;33:889-894. 28. Fox H, Bitter T, Horstkotte D, Oldenburg O, Gutleben KJ. Long-term experience with first-generation implantable neurostimulation device in central sleep apnea treatment. Pacing Clin Electrophysiol. 2017;40(5):498-503. 29. Carley DW, Prasad B, Reid KJ, et al. Pharmacotherapy of apnea by cannabimimetic enhancement, the PACE clinical trial: effects of dronabinol in obstructive sleep apnea. Sleep. 2018;41(1). doi: 10.1093/sleep/zsx184. 31. Central disorders of hypersomnolence. In: Sateia M, ed. International Classification of Sleep Disorders. 3rd ed. Darien, IL: American Academy of Sleep Medicine; 2014:146-163. 32. Morgenthaler TI, Kapur VK, Brown T, et al. Practice parameters for the treatment of narcolepsy and other hypersomnias of central origin. Sleep. 2007;30(12):1705-1711. 33. Billiard M, Bassetti C, Dauvilliers Y, et al. EFNS guidelines on management of narcolepsy. Eur J Neurol. 2006;13(10):1035-1048. 34. Szakacs Z, Dauvilliers Y, Mikhaylov V, et al. Safety and efficacy of pitolisant on cataplexy in patients with narcolepsy: a randomized, double-blind, placebo-controlled trial. Lancet Neurol. 2017;16(3):200-207. 35. Rouff C, Bogan RK, Emsellem H, et al. Evaluation of the effect of JZP-110 in patients with narcolepsy assessed using the maintenance of wakefulness test censored to 20 minutes. Sleep Med. 2017;35:12-16. 36. Swick T. Treatment paradigms for cataplexy in narcolepsy: past, present, and future. Nat Sci Sleep. 2015;7:159-169. 37. Evangelista E, Lopez R, Dauvilliers Y. Update on treatment for idiopathic hypersomnia. Expert Opin Investig Drugs. 2018;27(2):187-192. 38. Kunze A, Lancee J, Morina N, Kindt M, Arntz A. Efficacy and mechanisms of imagery rescripting and imaginal exposure for nightmares: study protocol for a randomized controlled trial. Trials. 2016;17:469. 39. Aurora RN, Zak RS, Maganti RK, et al. Best practice guide for the treatment for REM sleep behavior disorder (RBD). J Clin Sleep Med. 2010;6(1):85-95. 40. Moghadam KK, Pizza F, Primavera A, Ferri R, Plazzi G. Sodium oxybate for idiopathic REM sleep behavior disorder: a report on two patients. Sleep Med. 2017;32:16-21. 41. Shneerson JM. Successful treatment of REM sleep behavior disorder with sodium oxybate. Clin Neuropharmacol. 2009;32(3):158-159. 42. Liebenthal J, Valerio J, Ruoff C. A case of rapid eye movement sleep behavior disorder in Parkinson’s disease treated with sodium oxybate. JAMA Neurol. 2016;73(1):126-127. 43. Bornemann MC, Schenck C, Rosen G, Pressman M Sleep related movement disorders. In: Sateia M, ed. International Classification of Sleep Disorders. 3rd ed. Darien, IL: American Academy of Sleep Medicine; 2014: 228-279. 44. Ferre S, Quiroz C, Guitart X, et al. Pivotal role of adenosine neurotransmission in restless legs syndrome. Front Neurosci. 2018;11:722. 45. Allen RP, Picchietti DL, Auerbach M, et al. Evidence-based and consensus clinical practice guidelines for the iron treatment of restless legs syndrome/Willis-Ekbom disease in adults and children: an IRLSSG task force report. Sleep Med. 2018;41:27-44. 46. Salminen AV, Winkelmann J. Restless legs syndrome and other movement disorders of sleep-treatment update. Curr Treat Options Neurol. 2018;20(12):55. 47. Contin M, Lopane G, Mohamed S, et al. Clinical pharmacokinetics of pramipexole, ropinirole and rotigotine in patients with Parkinson’s disease. Parkinsonism Relat Disord. 2018;S1353-8020(18)30488-30487. 48. Silber MH, Becker PM, Buchfuhrer MJ, et al. The appropriate use of opioids in the treatment of refractory restless legs syndrome. Mayo Clin Proc. 2018;93(1):59-67. 49. Garcia-Borreguero D, Guitart X, Garcia Malo C, et al. Treatment of restless legs syndrome/Willis-Ekbom disease with the non-selective ENT1/ENT2 inhibitor dipyridamole: testing the adenosine hypothesis. Sleep Med. 2018;45:94-97. 50. Zucconi M, Galbitati A, Rinalidi F, Casoni F, Ferini-Strambi L. An update on the treatment of restless legs syndrome/Willis-Ekbom disease: prospects and challenges. Expert Rev Neurother. 2018;18(9):705-713.